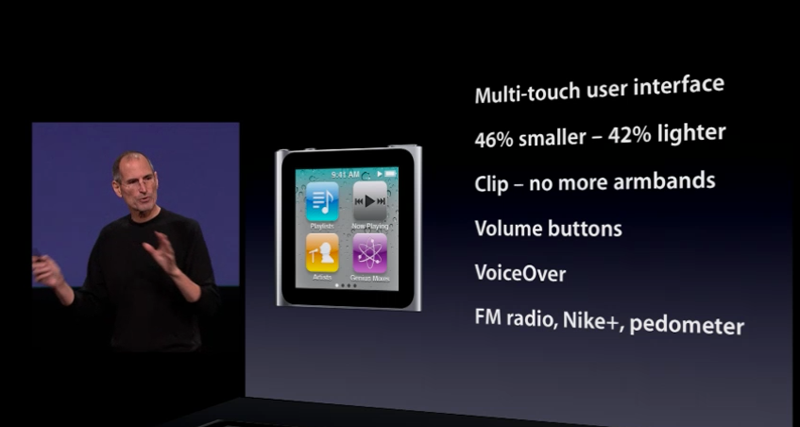 The new iPod nano, which had been rumored for weeks, was confirmed Wednesday by Apple Chief Executive Steve Jobs. He boasted that the new device is almost half as small and half as light as its predecessor. "It's so small, we're able to put a clip on it too, so it's instantly wearable," he said. Users can swipe through to choose icons including music playlists, artists and Genius mixes. It also has FM radio, podcasts, and the ability to view photos. Like on other iOS devices, users can move icons and drag them to different pages. The device also allows users to scroll as they do on the iPhone or iPod touch. The device includes hard volume buttons, voiceover, Nike+ and a pedometer. It works in 29 languages. Multi-touch input can also be used to rotate the screen. It will be available in six colors, $149 for the 8GB model, and $169 for the 16GB model. The internal battery provides users with up to 24 hours of music playback on a single charge. "This is the biggest reinvention of the iPod nano since its debut in 2005, and we think users are going to love it," Jobs said in a press release. "Replacing the click wheel with our Multi-Touch interface has enabled us to shrink the iPod nano into an amazingly small design that is instantly wearable with its built-in clip." iPod nano also features "Shake to Shuffle," giving music lovers the ability to shake their iPod nano to shuffle to a new song in their music library. With its built-in FM radio, iPod nano lets you listen to your favorite radio stations, and live pause lets you pause and resume playing your favorite FM radio shows without missing a beat. 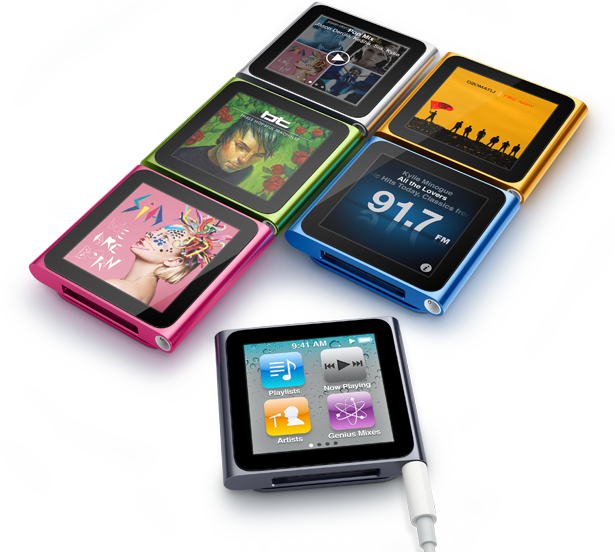 Multi-touch display: The best things in life have a soundtrack, and thats where iPod nano shines. The Multi-Touch display lets you experience your music in a new way. Tap to play anything you want to hear. Swipe the Home screen to browse your music by songs, albums, artists, playlists, genres, or composers. You can even rearrange the icons on your Home screen so your music is organized just how you like. Clip-on design: With the new built-in clip, you can walk, run, ride, or dance with your favorite songs on your sleeve (or pocket, jacket, or bag). The album art of the song youre listening to fits perfectly on the display. 24-hour battery life: The built-in rechargeable lithium-ion battery gives you up to 24 hours of nonstop music. So when you clip on an 8GB or 16GB iPod nano, youll have plenty of tunes to make it through your commute, your workout, and beyond. Shake to Shuffle: Now for something completely random. Give iPod nano a shake and it shuffles to a different song in your music library. Shake to Shuffle is perfect for when youre not in any particular music mood. You never know what youre going to hear, and youll always be pleasantly surprised. Genius Mixes: Say youre listening to a song you love and you want to stay in the groove. Just tap Genius. It finds other songs on your iPod nano that go great together and makes a Genius playlist for you. For more song combinations you wouldnt have thought of yourself, create Genius Mixes in iTunes and sync the ones you like to your iPod nano. Then tap the Genius Mixes icon and rediscover songs you havent heard in a while  or find music you forgot you even had. FM Radio with Live Pause: Ride the airwaves on iPod nano. The FM tuner shows the artist, song, or program youre listening to. Just tap to see the radio controls, flick the radio dial to change stations, and tap to set your favorites. Fitness: The new iPod nano design actually helps keep you fit. Its portable and wearable, which makes it runnable, walkable, and workout-able. Clip it on and control your music with just a tap or swipe of a finger, so you can stay focused without fumbling around. For your run, walk, or trip to the gym, a little iPod nano goes a long way.